Let the stripes in the fabric create the design on your next runner. You can make the pattern look as intricate or as bold and basic as you like with very simple piecing. 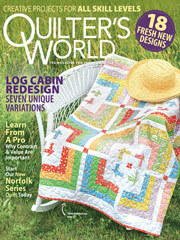 This e-pattern was originally published in the 2012 Quilting Calendar. Size: 48 3/4" x 20 1/4".